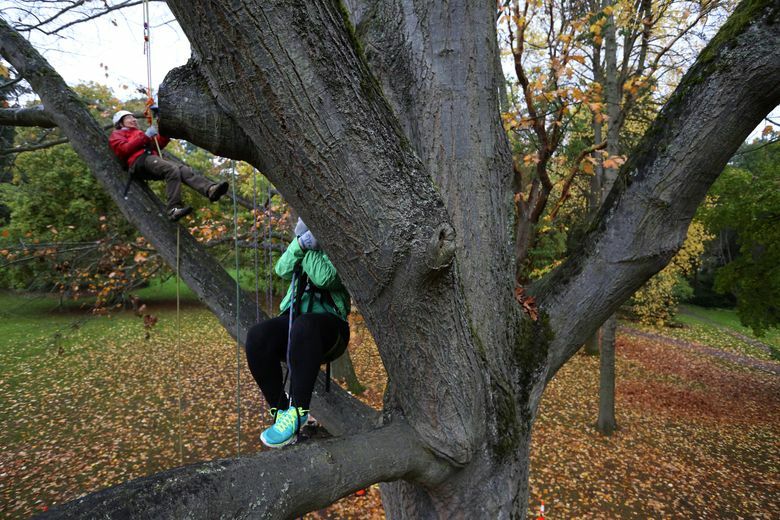 Big trees, such as Her Majesty, a 110-foot-high red oak at Volunteer Park, draw climbers of all ages. Big and beautiful, “Her Majesty” spreads her arms wide. Hers is a memorable embrace. 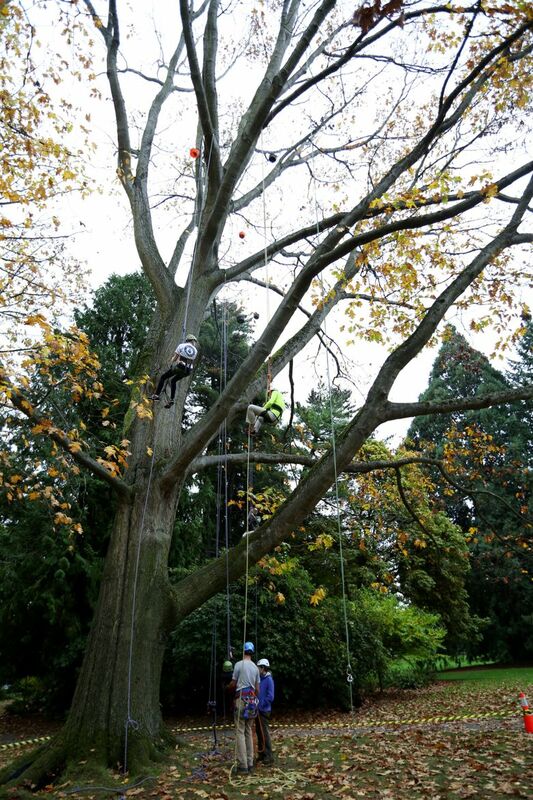 At 110 feet tall, the red oak at Volunteer Park is emerald with moss and pokes high into the sky. Her crown is gold indeed, with autumn leaves aglow, drifting in adagio twirls to the ground. 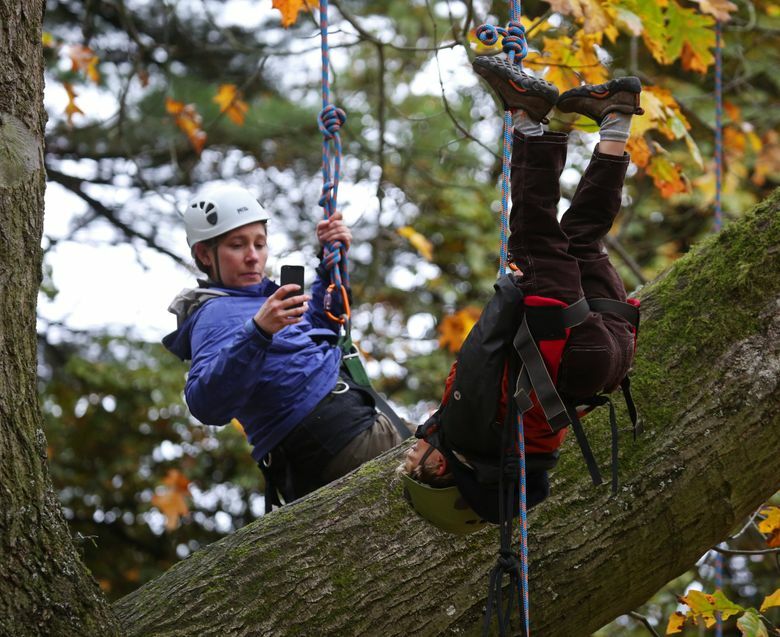 But she is busy, too: with people climbing up and down, as Dave Bayard of Canopy Climbers, tends their ropes. 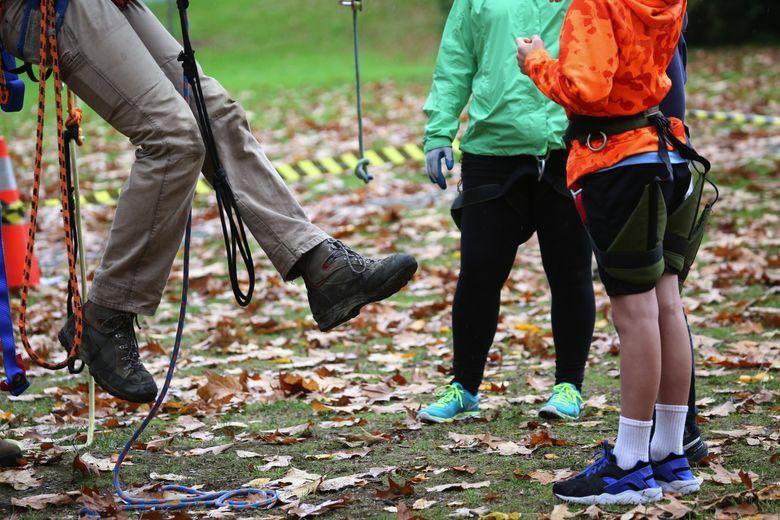 Some — always the kids — seem to get it immediately, hanging upside down in their climbing harness just for fun, twirling and spinning around — or vigorously inching up their rope. Others push themselves to do this, to overcome a fear of heights, or just to enjoy a feeling and view like none other. For a tree is not a rock or a ladder, it’s a living thing. A big tree like Her Majesty, as Bayard calls this big oak, moves in the wind. There is give in the branches, and a whole living world up in the canopy, all unto itself. 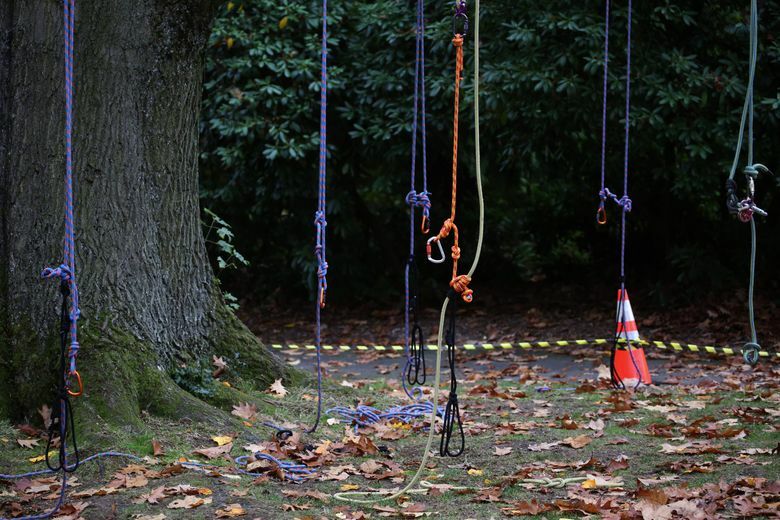 Bayard started offering recreational-tree climbs once a month during the spring and summer through Seattle Parks and Recreation four years ago. The climbs have become so popular he keeps a waiting list. In his day job, leading vegetation management at Seattle City Light, Bayard often has to trim or cut trees. 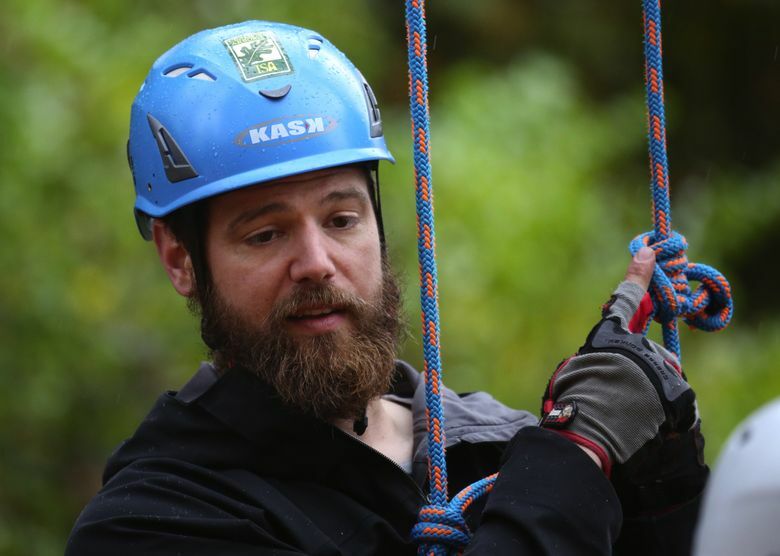 The day he gets to lead people into trees for fun is always the best one of the month, Bayard said. For one thing, he said, he loves watching a new kind of relationship between people and trees unfold. He is hopeful that in climbing trees, people also will become more curious to get beyond what can be a blank green wall of forest, to learn about the individual lives all around them: cedar, fir, spruce, maple. Moss, lichen, fern. Squirrel, bird. Whole worlds, within each world of each tree. 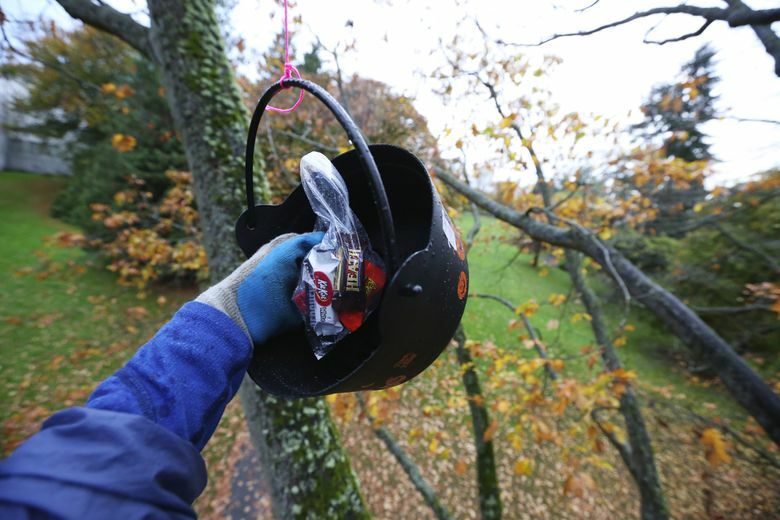 Bayard is careful of the trees, leaving nothing in them from the climbs, and using sleeves over the ropes to protect the branches’ bark from friction. As she talked, Margaux Cooke-Johnstone, 12, zipped down her rope and threw her arms wide in a triumphant gesture as her feet touched back on the ground after her climb. “You are up super high, and you can see so far, and as you are coming down you feel like you are in one of those spy movies,” she said. All of a sudden, Bates was back on the ground. “That was great,” she said, her voice soft and eyes big. “I can still see it in my mind, the mossy branches.” She had climbed up to the first big rank of branches, dozens of feet off the ground. Her sister, she predicted, would be amazed. As was she. Sidney Welsh, 6, bounded off his rope saying, “Mostly, I liked being upside down, except when I wasn’t, that time when I was super far out, and dangling. A soft patter of rain began to fall, rat-tatting leaves that glowed softly as fireflies in their autumn colors. The emerald of the moss on the oak’s branches seemed to grow deeper in color as the rain seeped into it, and the elephant hide wrinkle of the oak’s bark was wet and shiny in places with rain. 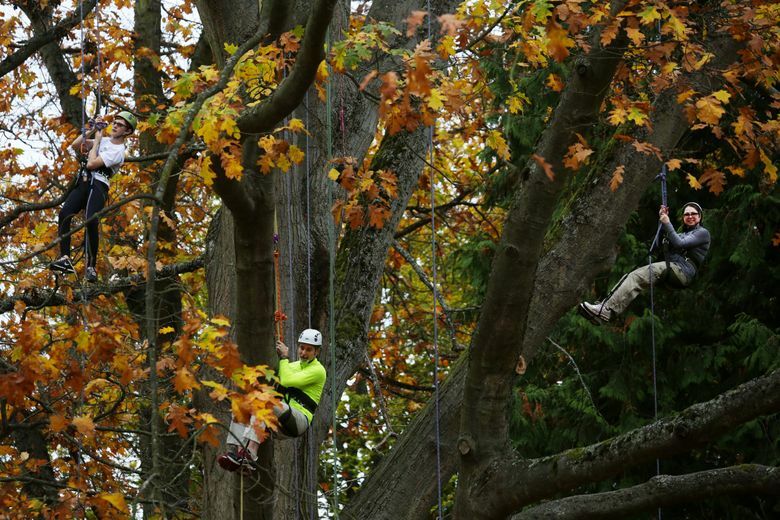 Bayard offers climbs in two trees at Volunteer Park: the big oak, and “Cathedral,” an even taller giant sequoia. 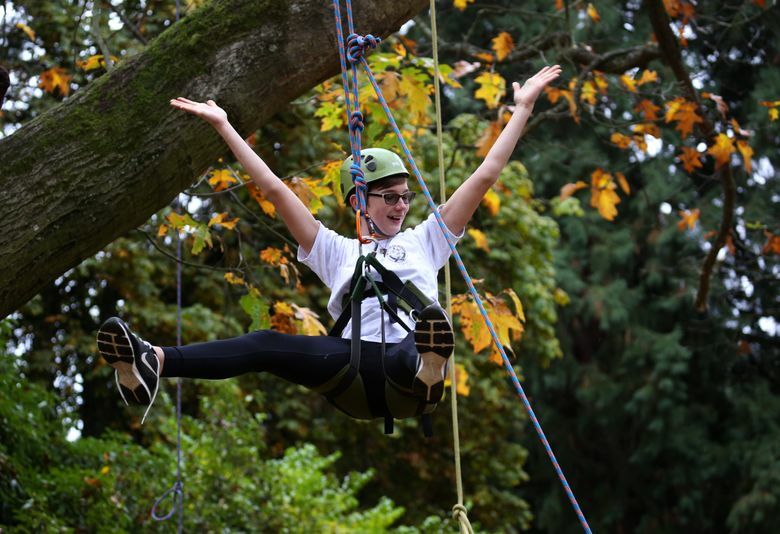 He also does climbs on “Stretch,” a sprawling big-leaf maple festooned with moss and ferns in a woodsier, forest setting at Camp Long in West Seattle. 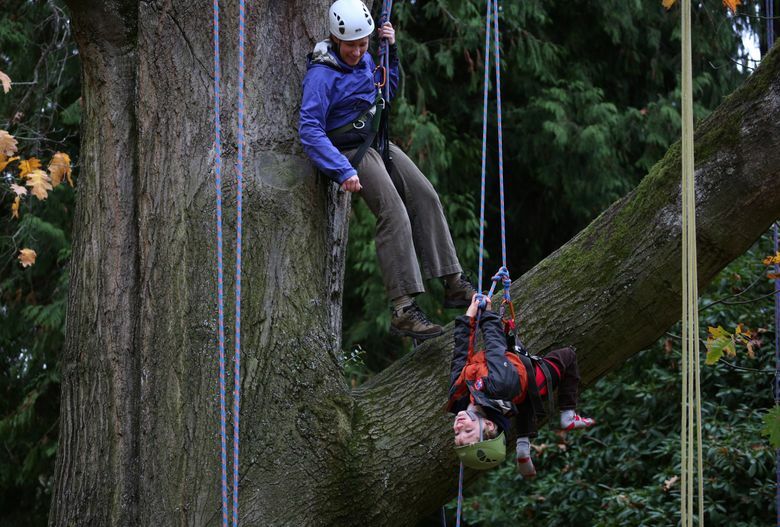 In addition to the $30-per-person group climbs at the Seattle parks, Bayard also does more expensive custom, personalized climbs, for everything from exploring a big tree in the backyard to a stargazing climb at night. 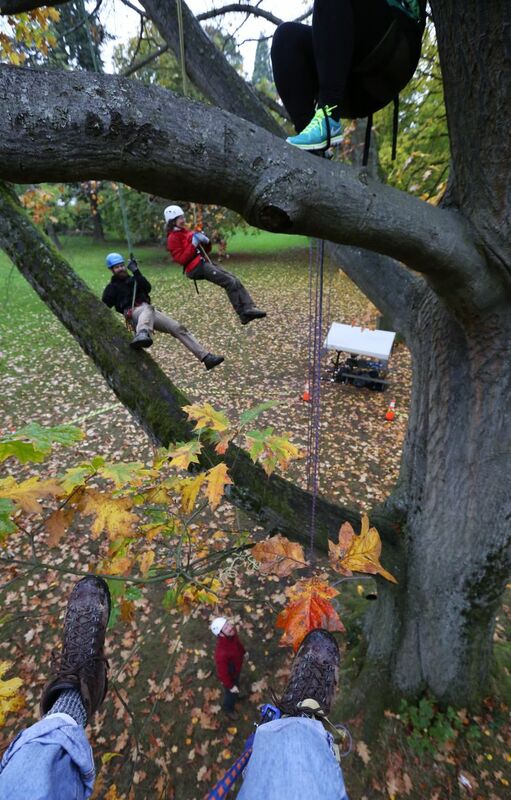 Bayard says he is pleased but not surprised to see recreational-tree climbing take off. It’s a deceptively powerful experience, taking adults from their distracted lives at keyboards and screens and putting them in the thrall of primal forces: gravity, height and the overwhelming physical presence of some of life’s biggest living things. As the climbers one by one left at the end of the day, there was no trace they had ever been there. Bayard packed up his equipment, rolled up his ropes. All the laughter, the energy and amazement that had happened that day had quieted. Her Majesty was regally unto herself once more. Bayard said he always gives the tree a thank you right before he leaves. It just feels right.